This is like apple pie in a bottle!! Back Label: The taste is in the secret. Let your imagination run wild with this apple cider liqueur to excite your taste buds from a recipe passed down generations ago. "At Amador Whiskey Company, we partner with the finest craft distillers to create limited edition luxury whiskeys. Our first release was crafted by the Charbay Distillery Master Distillers Miles and Marko Karakasevic. A blend of 60% straight malt whiskey and 40% hop-flavored whiskey distilled from a craft IPA beer, the components were aged separately for over two years in French oak wine barrels and then married in our family chardonnay barrels for another year before being bottled. We only made ten barrels of this superb spirit and hope you find it as special as we do. Glencadam Distillery opened in 1825 and since then little has changed. Multi-award winning Glencadam Highland Single Scotch Malt Whisky Aged 10 Years is a fine example of centuries of craftsmanship and tradition. “The rather delicate” malt with a beautifully balanced, pure flavour. Glencadam Distillery opened in 1825 and, since then, little has changed and our award-winning whisky. Multi-award winning Glencadam Highland Single Scotch Malt Whisky Aged 15 Years is a fine example of centuries of craftsmanship and tradition. “The rather dignified” malt with a beautifully mouth-watering, true flavour. Glencadam Distillery opened in 1825 and since then little has changed. Multi-award winning Glencadam Highland Single Scotch Malt Whisky Aged 21 Years is a fine example of centuries of craftsmanship and tradition. “The exceptional” malt with a beautifully lingering, true flavour. 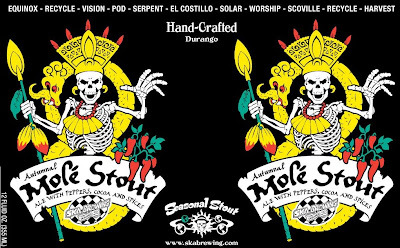 Ale brewed with Toasted coconut, coffee, vanilla, cinnamon, chocolate and cocoa nibs. Ungava Canadian Premium Gin originates on the northern frontier where the vast Canadian tundra meets icy seas. Its particular aroma can be traced back to six rare botanicals, native to the Arctic region, that enter its composition. Handpicked in the wild during the fleeting summer season, then infused the traditional way, they are handcrafted into an authentic gin with a unique taste to the delight of adventurous amateurs and connoisseurs alike. As subtle as it is intriguing, Ungava Canadian Premium Gin reveals a style that is all at once lively and smooth, fresh, floral and spicy. The precious plants and berries of the tundra release their natural colour and aromas to yield a gin that is exquisitely well-balanced. Right from the first sip of Ungava gin, you embark upon a unique journey of the senses. On the nose, the Nordic Juniper supplies ample notes of zesty citrus; on the palate Ungava reveals progressively the fullness of its flavours and the richness of its bouquet. The refreshingly fruity and sweet-tart notes of Crowberry and Wild Rose Hips are expressed over a rich and spicy underlying botanical base that combines Cloudberry and Arctic Blend. The Nordic Juniper brings a finishing touch of mentholated citrus that cuts through the Labrador Tea's mild herbal flavour and lengthens the mix with velvety smoothness. Naturally fermented from the finest barley. Ingredients: water, barley malt (contains gluten), sugar, carbon dioxide, hops. 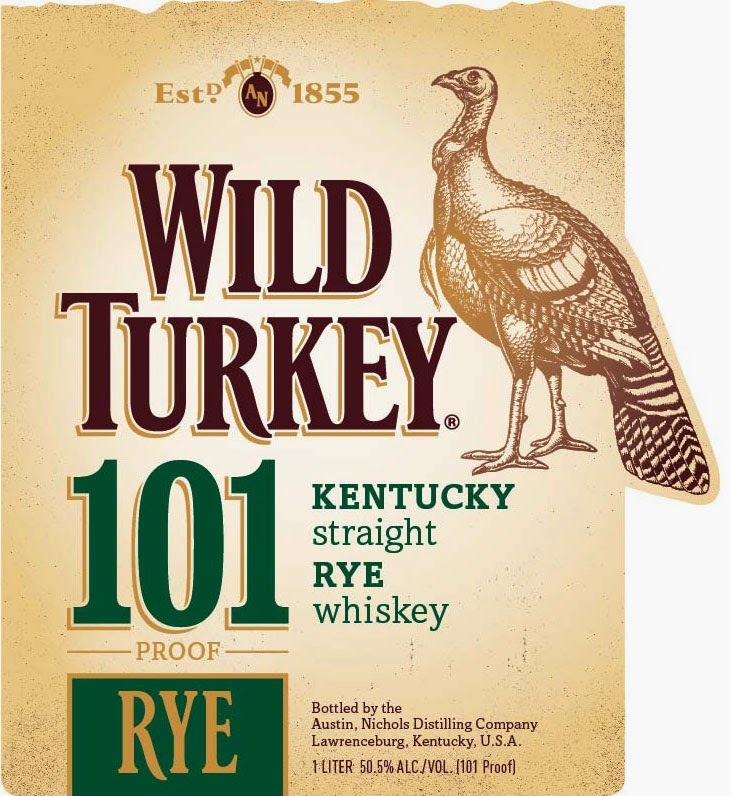 A few years back because supply took such a huge spike, Wild Turkey switched from 101 proof to 81 proof on their rye. The 81 proof was 4-5 years old to help fill demand. Well, the 101 proof is back and even though there is no age statement, it is about 6-7 years old. It is only in liters. A beer fit for a blacksmith. Honoring our favorite local blacksmith, this flavorful Stout is a selected mix of ten malts and five hop varieties. Imperial Stout was a key British export in the Baltic trade that elevated art and industry in Russia and England during the 18th Century. Celebrate craftsmanship and raise a glass to broader flavor horizons. Sheep Eater Scotch Ale was first brewed in 2009 and has become our Cellar Reserve most-requested for a comeback. Scotland's cold, blustery climate lends itself to the growing of barley and oats but not to the production of hops, which are almost always added sparingly. In order to create depth and diversity in the beers brewed in Scotland, malts were roasted and kilned to help bring out hidden flavors. Scotch Ales are some of the world's most flavorful beers. The specially roasted and kilned malts used in the mash impart roasted, caramel, and raisin sweetness to the flavor profile. Our ale is brewed with black roasted barley and peat-smoked malt, adding even more complexity to the palate. 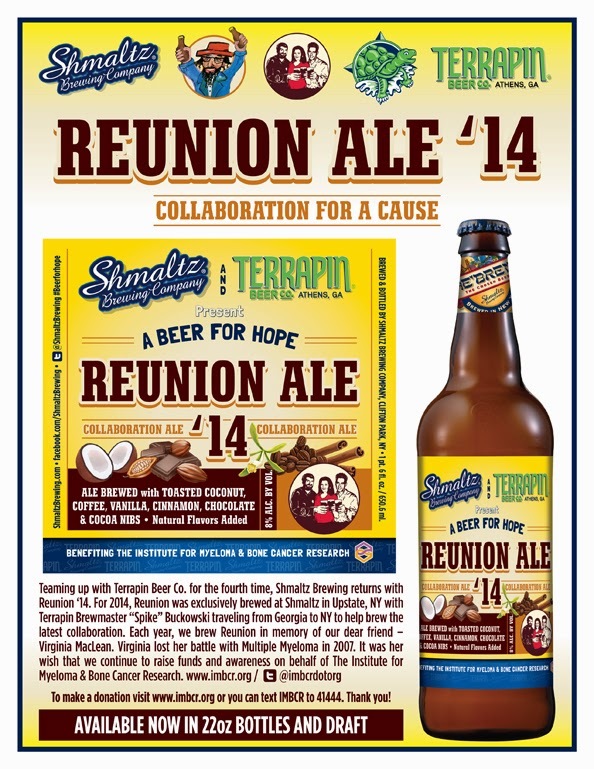 It is gently hopped, fermented cool and aged cold for exceptional smoothness. The result is a copper-brown color and a pleasant mouthfeel and body.We ferment this beer colder than most ales ferment so that we do not risk producing any flavors driven by yeast-produced esters. Instead, we want the malt to shine through and provide all the wonderful flavors Sheep Eater has to offer. Drink this beer at cellar temperatures between 47-57 degrees Fahrenheit. The strong dark malts and high levels of alcohol will make this beer an ideal candidate for prolonged cellaring. Enjoy this beer with flavorful meats such as honey ham, well-marinated and grilled steaks, and roasted root vegetables lightly seasoned with salt. With dessert, try crème brûlée and a side of berries; the light and airy texture of the crème brûlée and tartness of the berries will balance nicely with the thick, sweet mouthfeel of Grand Teton Brewing’s Sheep Eater Scotch Ale. "OK, so the joke was Jolly Pumpkin doesn't brew a pumpkin beer. Well, now we do. Just this one. 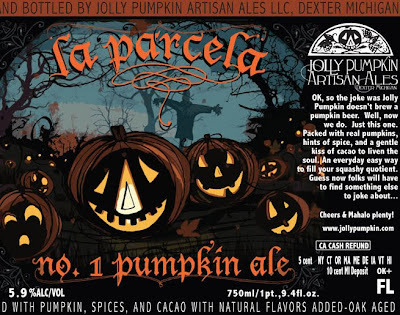 Packed with real pumpkins, hints of spice, and a gentle kiss of cacao to liven the soul. An everyday easy way to fill your squashy quotient. Guess now folks will have to find something else to joke about...." -- label. We have not seen this since 2010 in St. Louis! 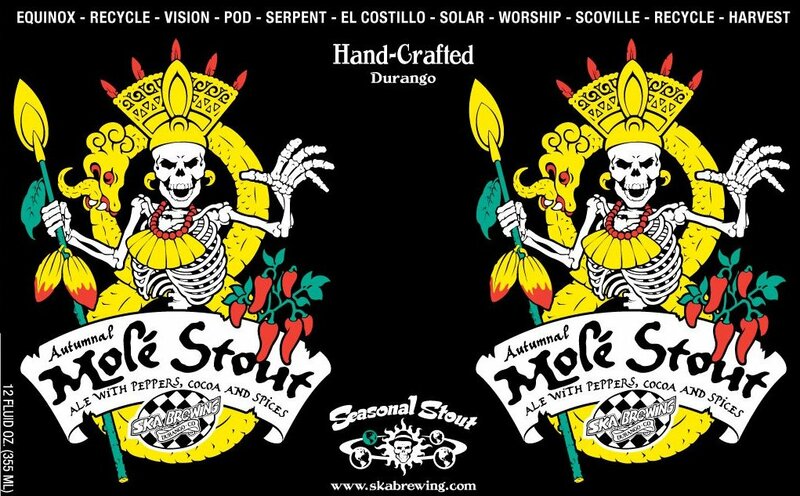 Ska Mole Stout is back!